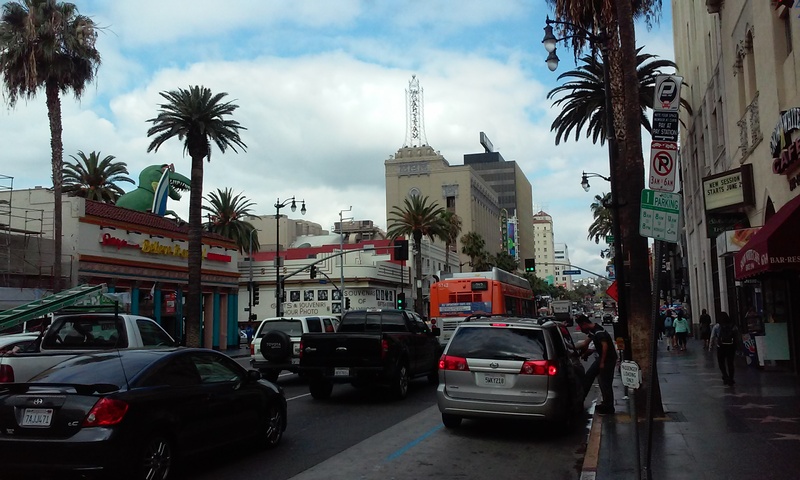 Posted on June 17, 2015 by Lea S.
So about two weeks ago I was on my post-San Francisco, solitary trip to a magical realm I’d always been dying to visit: Hollywood! After years of dreaming of going and wondering when that would happen, I decided: hey, it was only a short flight from Frisco, why the heck not?! 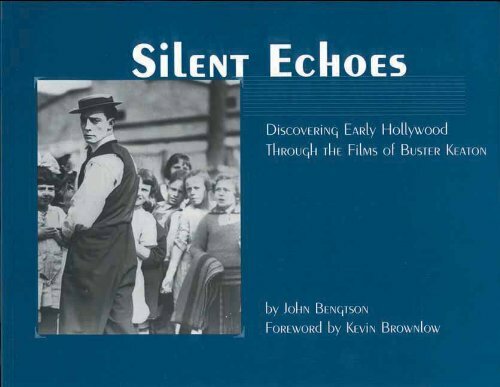 I also downloaded this tour from Bengtson’s wonderful blog (I swear he didn’t ask me to do this name-dropping–it really is the indispensable resource if you have any interest in silent Hollywood!). My Hollywood episodes of I Love Lucy all re-watched, it was time to head to California. My friend, long-time Los Angeles resident and fellow Keaton fanatic Shaune, picked me up from LAX in the afternoon. The sun was shining, there were palm trees dotting the hillsides…this was the L.A. I’d been picturing! On route to the hostel (I’m a budget traveller) she took me on a mini tour, driving past Sony Pictures and Fox Studios and through some of the swanky Beverly Hills neighborhoods. 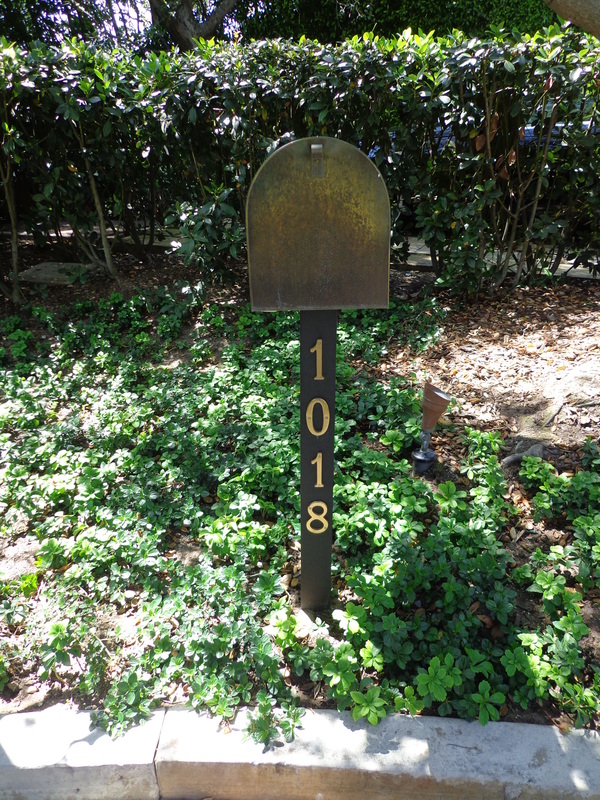 And we thought we’d try to find a certain address, on a certain Pamela Drive…does the number on this mailbox ring any bells for anyone? …Certain fans of a certain comedian, perhaps? But I still snuck this photo of the gate!! I must sadly assure you that from no angle there or anywhere on the surrounding streets is it possible to actually see the Villa, not even a wee little peek. There are hedges, trees, and presumably walls blocking the way. BUT SHAUNE AND I GOT CLOSE!! Hungry after this daring Mission Impossible-esque adventure, we stopped at a McDonald’s on Sunset Boulevard, which occupied the spot where Alla Nazimova’s Garden of Alla Hotel once resided. Chicken nuggets and Sprite taste much better after you’ve tried to infiltrate the palatial grounds of 1920s comedians, I’ve found. We then stopped by another historic monument (and this one had a plaque)–Charlie Chaplin’s studio, now the home of the Jim Henson Company, beautifully preserved in all its English architectural glory! Notice Kermit dressed as the Little Tramp adorning the tower. Charlie was painted on one of the doorways, too. Who could resist taking a picture with him? 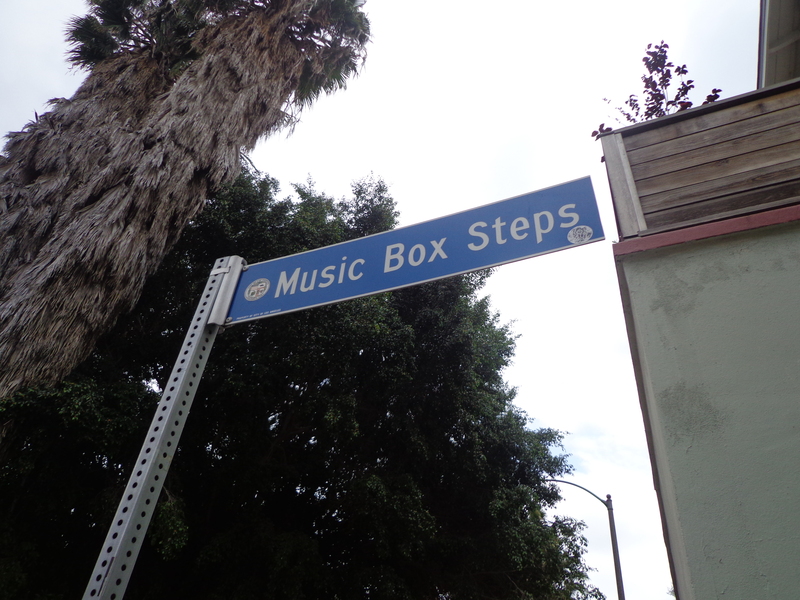 At my hostel, a mere hop, skip and jump from Hollywood Blvd, I bid adieu to Shaune and then went out exploring. I was here. I was here at last–glorious, historic Hollywood itself! 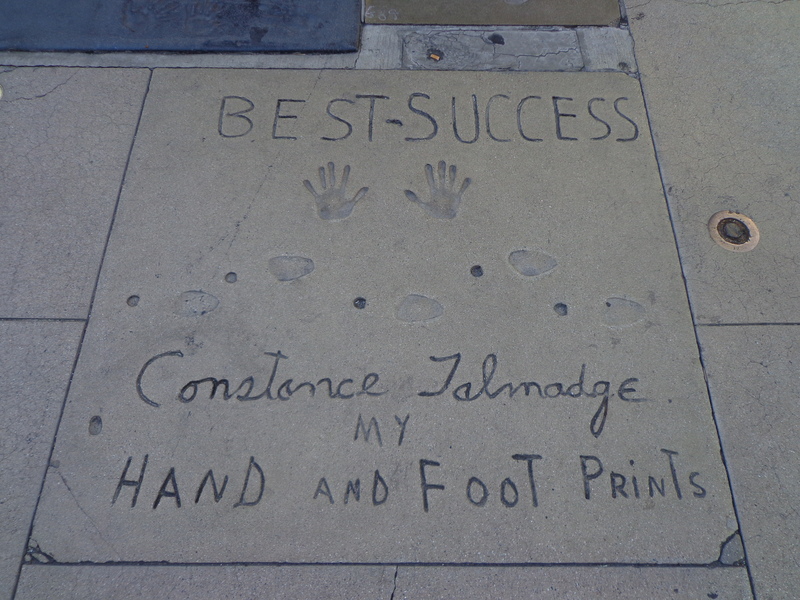 And right around the corner was Grauman’s Chinese Theater, with all that famous cement. It’s exactly like you’ve always pictured it, and I was giddy with delight. 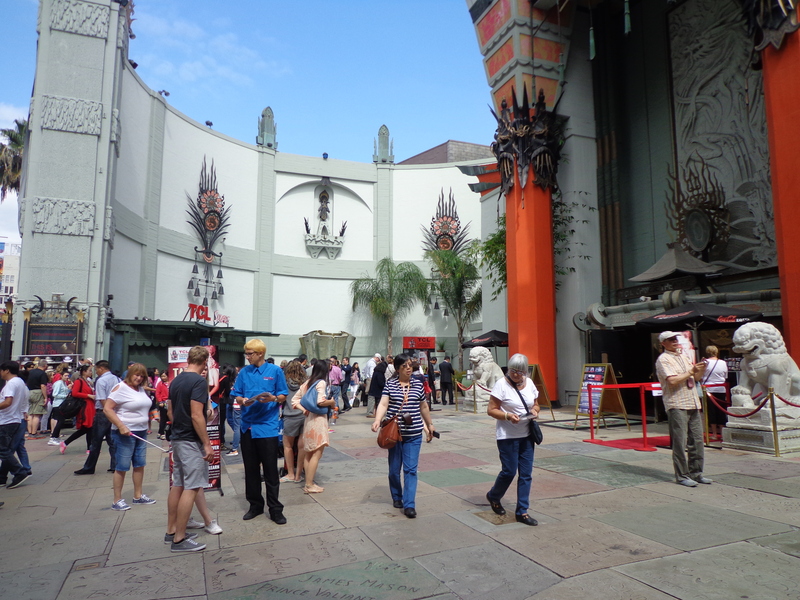 I then strolled up and down Hollywood Blvd, gawking at the gigantic Hollywood and Highland shopping center with its two replicas of the Intolerance elephants and the Dolby theater where the Oscars are held. The Hollywood sign was in the distance, visible from the shopping center. I spent far too much time reading the Walk of Fame stars (they seem to go on for miles!). I was very happy to see that Harry Langdon’s star was directly in front of Grauman’s, where at least plenty of people see his name! And good gravy, that was only my first half day! The next day, which dawned gray and drizzly (figures), I was on a mission. 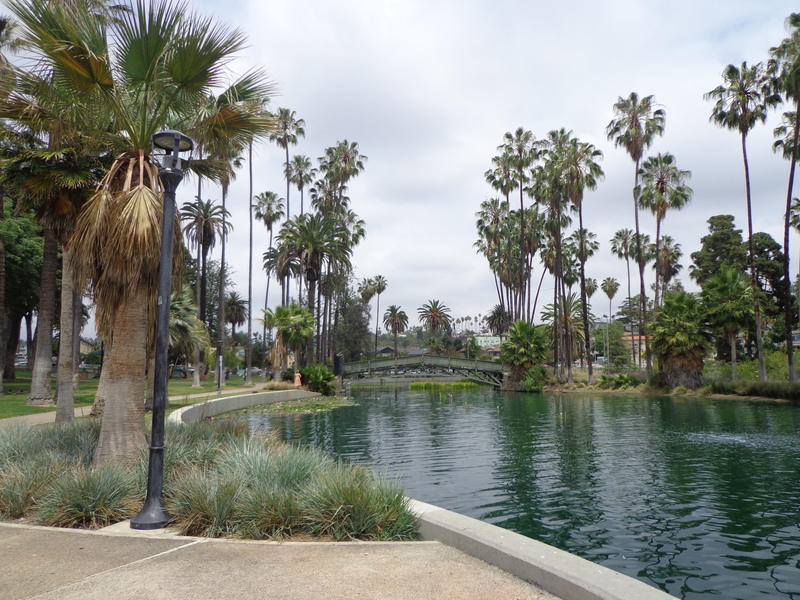 After breakfast at the Coffee Bean & Tea Leaf, where the people watching is off the charts, I hopped on one of the local buses and took it down to…Echo Park! The setting of many a wondrous Keystone comedy featuring Roscoe Arbuckle, Mabel Normand, Charlie Chaplin, Ford Sterling, and many more pratfalling personalities. The same area in Mabel’s Married Life (1914), although the bridge was quainter back then. It was a beautiful place, with a trail that circled the lake and a tall fountain jetting up from the water. I fed pigeons some cookie crumbs as I sat on a bench picturing the “mustachioed hero + girl + park bench + policeman” Keystone films in my mind. 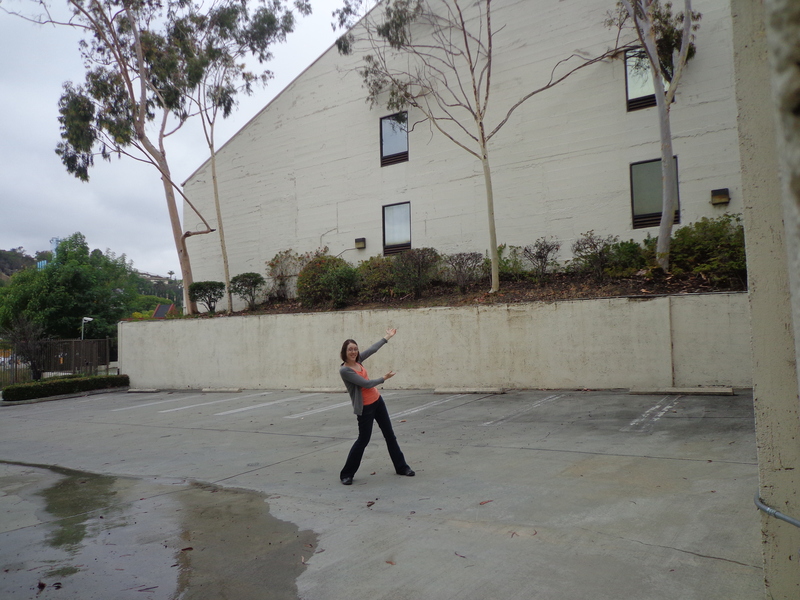 …the Keystone Film Company studio lot!! That huge white shed-like structure is the last original building that remains. At one time, a big sign saying “MACK SENNETT” adorned the top. Note the commemorative plaque (that gray rectangle) on the lower wall. Hurray for self-timers on cameras! After eating a fast food lunch practically on the spot where Charlie Chaplin debuted in films (I saved my sacred burger receipt and the sacred patterned paper lining the food tray), it was time to head out to one more precious site, via another long but doable walk. 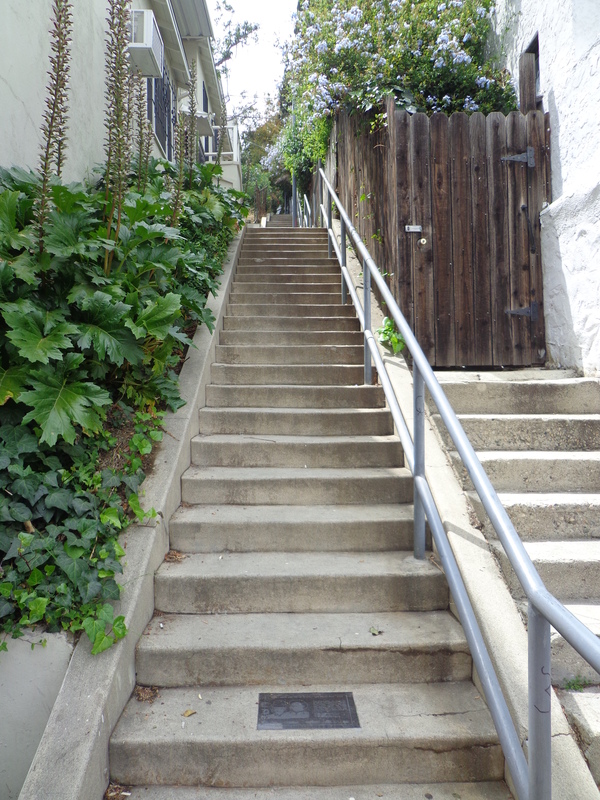 My goal was a simple set of concrete steps. A very long set of concrete steps. Being one of the many, many Laurel and Hardy fans out there who grew up with their films and whose families have always quoted them on a regular basis (just why are L&H so darn quotable? ), well…let’s just say that this was a Hollywood Essential. After walking up and down all 147 steps (you definitely huff and puff by the time you get toward the top! ), taking a ridiculous number of pictures, and quoting “‘Heave!’ ‘Ho!’ ‘Heave!’ ‘Ho,‘” a big item on my bucket list was thereby checked off. Whew, what a day–time to head back to the hostel, rest a little while, get dolled up and go out to eat at the Pig’n Whistle next door to the Egyptian Theater on Hollywood Blvd. Pig’n Whistle opened in 1927, and the stars used to go there and discuss “the business” after lavish Egyptian Theater premieres. And it’s relatively affordable. I had the steak salad, a glass of chardonnay and a piece of cheesecake (visiting historic comedy sites makes one quite hungry). 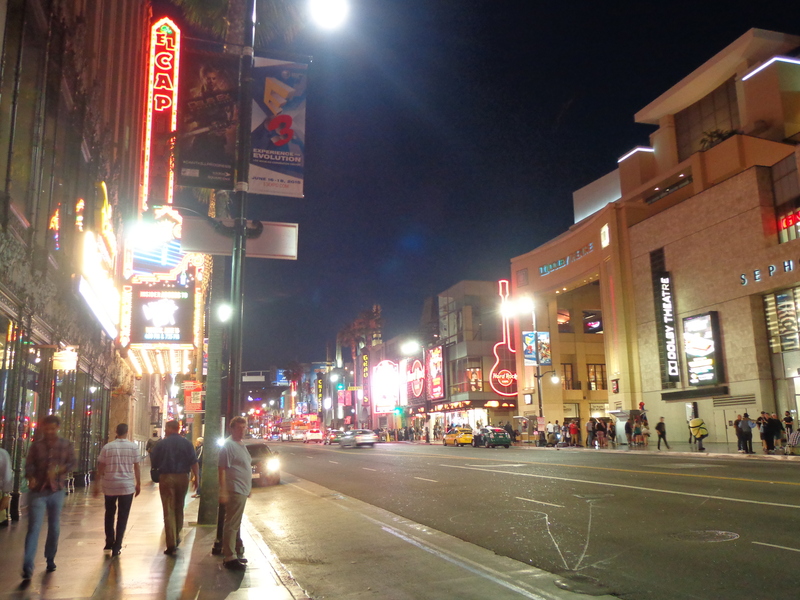 After an evening stroll up and down glowing Hollywood Blvd, my first full day in L.A. was at an end. On this second full day in L.A., gray again but thankfully not drizzly, I went to visit my number one Hollywoodland site. Leaving the hostel as early as I could (okay, about 9:30), I took another one of those nice local buses to the Forest Lawn cemetery in Hollywood Hills. I took it to a stop that was supposedly close to cemetery, but ended up walking and walking and walking just to get to it, and then had to walk all the way through it–those manicured grounds are vast! So you could say that I went on a literal pilgrimage to this marker. It was well worth it. The marker was bare when I got there–I left the flowers and things you see above, for myself and on behalf of other Keaton-loving friends. The train seemed like the right sort of thing to leave there (it took a little hunting in Hollywood souvenir shops to find a suitable one). I tidied the marker up, too. What a surreal feeling it was to be kneeling there, plucking up excess grass from around the grave of someone whose work has meant so much to so many. Yes, there were tears. My pilgrimage complete, I returned to Hollywood Blvd to replenish myself at Subway and trek to the next big stop–the Hollywood Forever cemetery. Doesn’t look like much? 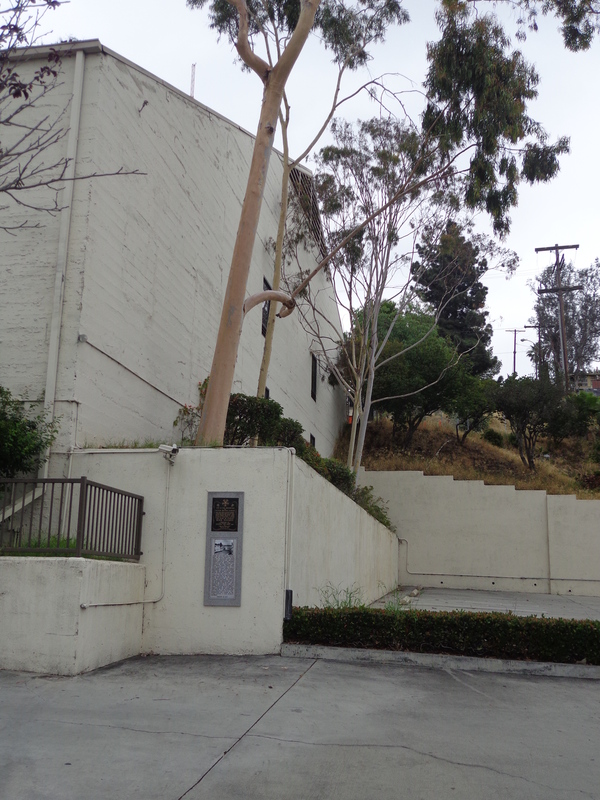 Well, the building itself isn’t important, but the spot it’s built on is–the former site of the Buster Keaton studio. (Gee, why ever would I go there?) The commemorative marker is famously on the wrong street corner, that one on the right that’s almost out of sight. This is the alley that Buster ran down in Cops, and the spot where he turned, grabbed a passing car and flew out of the frame!! 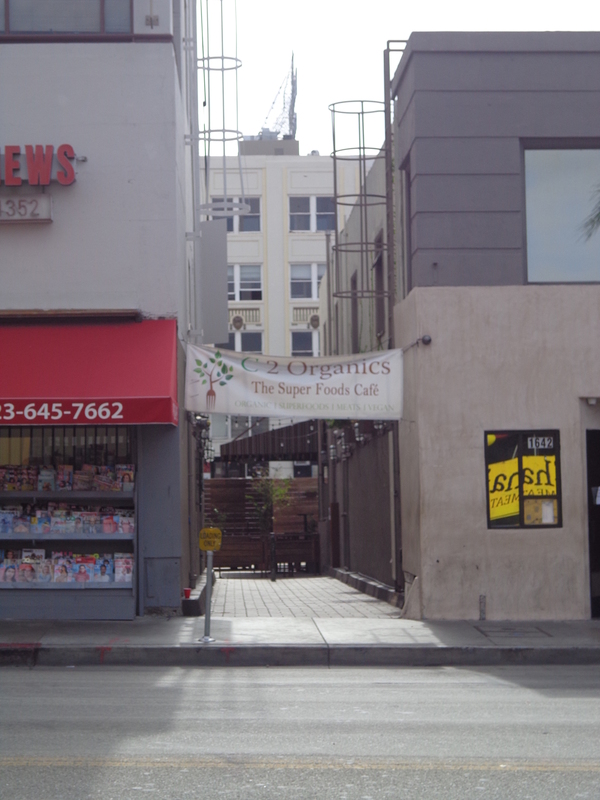 It’s now, err, an organic “Super Foods” cafe. If that alley weren’t awesome enough, the space behind it is where Charlie filmed scenes from The Kid (my favorite Chaplin film). And Harold filmed some scenes for the classic Safety Last in that same area too! After that long day, Hollywood Blvd had one more surprise in store–an honest-to-gosh movie premiere was going on at the Dolby theater. Sadly, it was only for some horror movie called Insidious 3, but hey, at least I can say that I saw a red carpet premiere. I would’ve liked to dine at the Musso & Frank restaurant, which opened its doors in 1919, but my budget screamed at the thought so I had some excellent Chinese food instead. The second–and final–full day in Hollywoodland was complete. One last breakfast at the Coffee Bean & Tea Leaf, one last stroll around Hollywood Blvd and down Cahuenga (couldn’t resist), and sadly it was time to head back to LAX. Although my stay in Hollywoodland was relatively brief, I had packed in a very satisfying number of sights. Incredibly, I had started to feel “acquainted” with the area that I’d read about and seen in films all my life. Now that’s a feeling! If I could’ve stayed a couple more days it would’ve been fabulous to see the Paramount Studios gate, the Hollywood Heritage museum, the Forest Lawn Glendale cemetery and one of the beach towns like Long Beach. But overall the trip had still been perfect. Until we meet again, Hollywoodland. I can’t wait. This entry was posted in Uncategorized and tagged Buster Keaton, Cahuenga Blvd, Echo Park, Forest Lawn Hollywood Hills, Grauman's, Hollywood, Hollywood Forever Cemetery, Hollywoodland, Keystone Film Company, Music Box Steps, Stan Laurel, Sunset Blvd by Lea S.. Bookmark the permalink. Glad you enjoyed it! 🙂 Yes, that pilgrimage to his grave was quite the emotional experience…an essential stop indeed. Oh, Lea, this was a wonderful piece! I have SO much of an appreciation of the distances you traversed on foot in the big boss basin called LA! 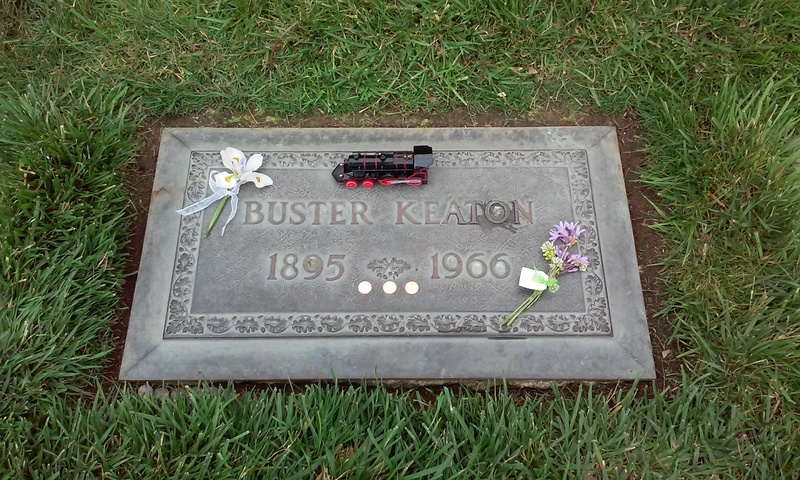 The photograph of Buster’s resting place and the little train you placed on it brought tears to my eyes. The descriptions of your excursions around Hollywoodland were so vivid … I could almost see Buster’s arm shoot out and his hand grab onto that car as it shot by him on Cahuenga. I really enjoyed reading about your adventures. This is wonderful!! 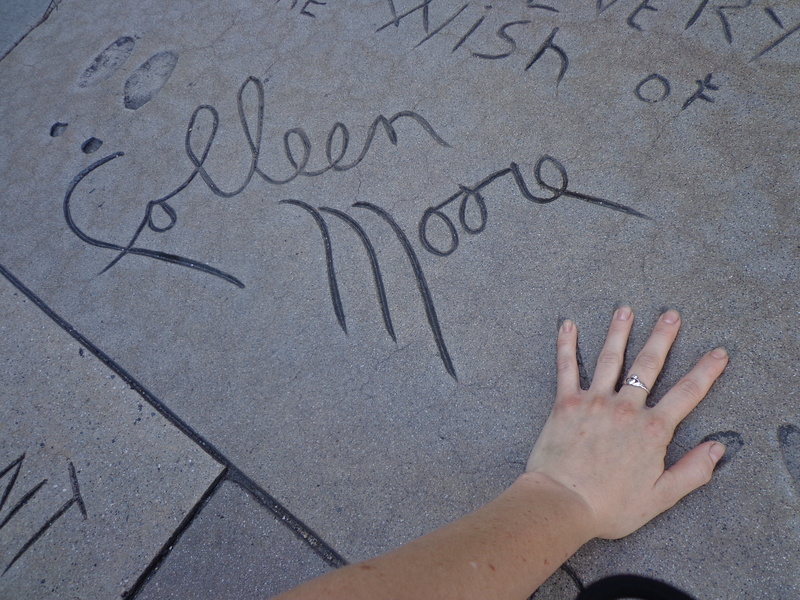 I’ve only been to Hollywood twice (both times for #TCMFF) and it’s always incredibly magical. But due to the fest, I still have yet to see SO much of Hollywoodland that I desperately NEED to see. Your post highlighted a majority of those places. Hopefully on my next trip! In the meantime- will you be going to this year’s Buster Keaton Celebration in Kansas?? And Marx, Groucho’s grandson will be there- it’s always SO fun! By all means, if you go to the TCM festival again take a couple extra days either before or after the event to explore Hollywood! Or, heck, just plan a trip there regardless. You will not regret it!! You know, I was thinking about attending the celebration this year (it would be yet another new experience! )–will let you know if I’m able to go! Groucho’s grandson will be there?? How awesome is that? Very nice. I did a similar photographic trek once in L.A., hitting all of the ‘Hollywood’ highlights I could think of. I COULD say that I hope you had a great time, but it’s obvious that you did. How cool! I saw a show on Travel Channel which was touring historic places related to Charlie Chaplin and apparently there is a U-Haul storage center around that area which was used as a set. So if you go up to the second floor and look up all the original wires, pulleys, and rigs are still there! The description of the storage center sounds very much like the big white building on the Keystone lot…perhaps they’re one and the same? Maybe! Either way I’m very jealous of your trip! So enjoyed reading about your trip. I last visited in 1987 and need to come back soon while those sites still exist. 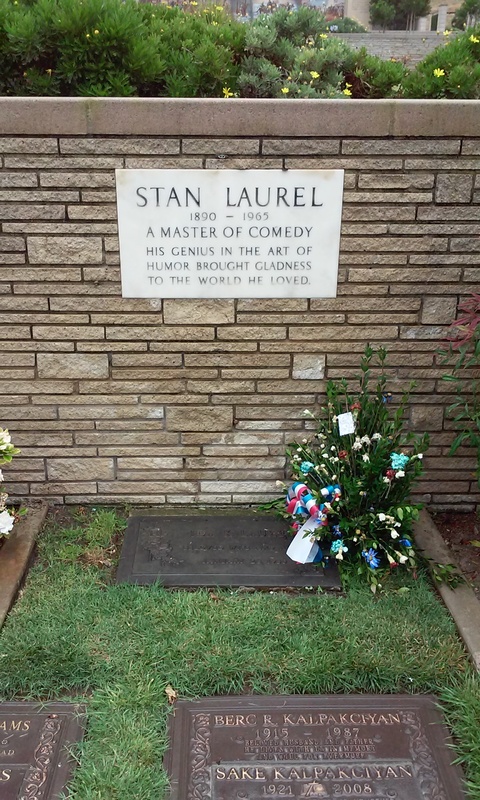 I visited the Music Box steps and Hollywood Forever cemetery (and I DID get to see Valentino’s crypt and see a mysterious lady in black with an armload of fresh flowers enter the mausoleum after I left … I couldn’t resist going back minutes later and sure enough, there were fresh flowers in Rudy’s vase!). I drove by the Chaplin Studio (then owned by Herb Alpert) and posed for a photo at the Paramount gate on Marathon Ave (now enclosed by a wall). It was thrilling to see those sites I’d only read about. Thanks for sharing! I recognised the alley immediately!! Sounds like an amazing trip! I’m somewhat intrigued by the Toto monument. Isn’t Toto a bit, you know, fictional? I’d always imagined he had a life before and hopefully after meeting Judy Garland. “Amazing” is definitely one of the many words for it! It fulfilled many dreams, lemme tellya. In a better world, they would have put a little kink in the freeway to avoid it. I know I’ve only just recently followed your blog, but I couldn’t help but want to comment on this post right away! It’s so nice to see Hollywood through a fresh pair of eyes, especially as a local. Reading about all the adventures you went on is motivating me to check out the historic silent film locations that I still have yet to see! However, I did get to visit Buster’s resting place a few months ago, and can completely empathise with you. It certainly is surreal to be there. Why welcome, Nicole! Stop by as often as you like. 🙂 Aw, I’m glad my post is inspiring you. How cool that must be to be able to hop in your car and see these amazing places so quickly–you are envied! Visiting Buster’s grave was not only emotional, but rather impressive too. He could’ve been given a grand monument in a place like the Forever cemetery, or the Glendale cemetery, but he chose to be buried there, surrounded mainly by locals, with a simple marker like everyone else’s. Thank you so much! I also had a friend with me that day (for emotional support), and we were talking about that, too! It’s very humbling. It’s great to read your blog—I share your enthusiasm! And there’s no comic like Buster Keaton! By the way, I just read “I, Fatty” by Jerry Stahl. I liked that it gave a sense of what it might have been like to have been one of those motion picture pioneers, and Buster Keaton plays a prominent part in Fatty Arbuckle’s story. 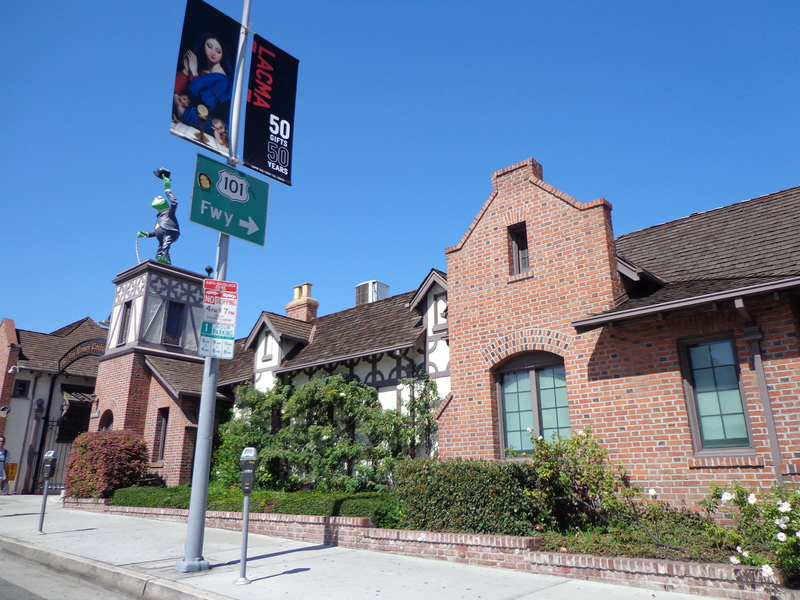 After reading it, I took a jaunt over to historic West Adams and saw Roscoe Arbuckle’s mansion—I think Theda Bara lived there, too. 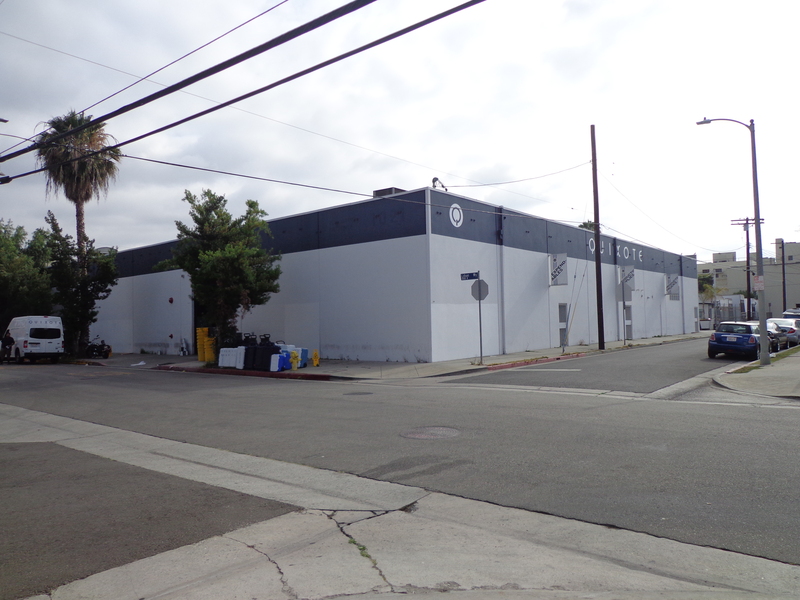 There’s a hard elbow turn from Glendale Blvd onto a side street that is across from the sight of the Mack Sennett studio building that you visited. I recognized it from a number of the Keystone Cops films—They careen around that turn on two wheels in several films, and though the original buildings have changed slightly, it is still recognizable. I don’t think I would have noticed it if I’d been coming from the other direction. Oh, and about a mile north from there is a shopping plaza that is on the sight of “Mixville,” where Tom Mix made his westerns. It’s hard to imagine this area, now congested and dotted with hillside homes, as once being so rural that it appeared in so many films as the Old West…. Well, anyway, I’m rambling now….I’m happy that I discovered your blog. It’s great!! 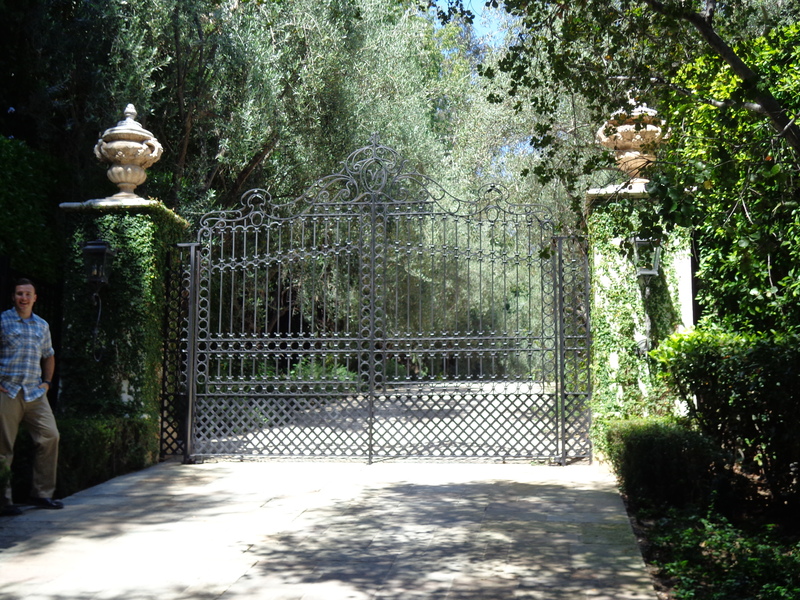 If I’d had a few more days to spend in Hollywood, seeing Arbuckle’s mansion probably would’ve made it on the list. It’s so much fun to see those places with your own eyes–even seeing something as seemingly mundane as the streets people filmed on really makes the era comes “alive,” For instance, seeing the site of the Keystone studios was exciting not only because that one building was still there, but because all those hillsides around that you see in so many ancient comedies are there, still recognizable. And you can tell which houses are the oldest, and were probably in the background of a lot of scenes! And need I mention how much fun it is to rewatch those old films and think to yourself “I was there”? Reminds me so much of my first trip to Hollywood. I’ve been back several times since (next one coming in September), but there’s still so much more I have yet to see. 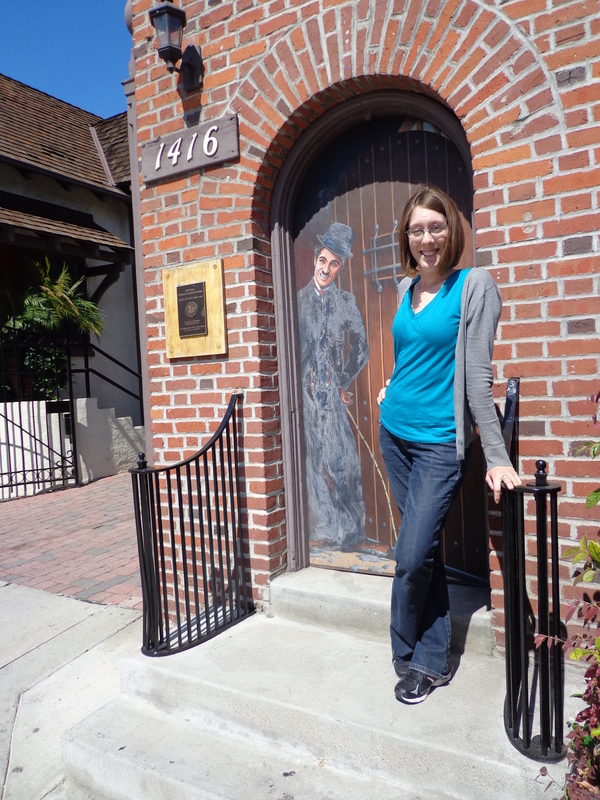 Every trip I always make sure I visit the Chaplin Studio and the alley off Cahuenga, though. Still need to visit Echo Park. Future trips will probably be mainly for research, but I’ll always make time for a little sightseeing. Thanks for sharing your trip! So glad you had a great time. I would love to pay my respects at Buster’s resting place, but I think I’d become a blubbering mess! This sounds magical. I think you’ll cherish all the memories forever. I love how you saved the receipt and the tray lining – I thought that was the sort of behaviour only I would indulge in – happy to find a kindred spirit. Lea, I think we missed each other by a week. I was in Hollywoodland the last week of June. I would add to your list, El Sid, a Mexican dance club inside of an original building from the 1915 Griffith Studio at Sunset and Hollywood Blvd. Its where he filmed Birth and Intolerance among others. Griffith’s one-reeler “In Old California” was the first film shot in Hollywood – and it was written by S.E.V. Taylor ;^). I probably walked by that very location! Will have to keep it in mind for next time. Wow, this sounds like such a nice visit. I hope to go there one day, but you do an excellent job of making me feel I was there already! Thanks for the tour. 🙂 I really enjoyed reading it. The little train on Buster’s marker was very touching. I know he would have loved that. I’m sure you’ve probably seen the short Round About Hollywood short from 1931? I love the feel and the sound and the look of that little film. I’ve watched it several times. And it’s interesting because it’s a chance to to see almost-silent-era Hollywood in color. If you’ve seen it, I wonder if you covered any of the same areas in your goings-about? That video’s new to me, thanks for sharing! A lot of the buildings on Hollywood Blvd are still there, and recognizable in some of the shots. Don’t you just love footage of those old film premieres? So full of light and glamour. It was very exciting to actually be at Grauman’s and picture all those glittering events. Amazing! I love that comparison picture with the bridge!! What an amazing trip. Great job describing it. I hopefully will be going to Hollywood many more times, but nothing will beat the perfection of that brief, memorable trip!! I’m glad you had a good time. Nice posting, as always thanks!